So you own a mass transportation vehicle and it’s starting to have issues. Whether it’s the engine, transmission, cosmetic or the interior, let Coughlin Transportation take care of it for you! Coughlin Inc offers professional maintenance services for those unable to work on buses themselves. Our trained mechanics have extensive knowledge in terms of repairs, regular maintenance scheduling, parts and inspection requirements. Their thorough expertise has evolved over time and experience, along with their passion for the safety of all bus passengers. Coughlin Transportation offers full-service leasing opportunities. Most vehicles are 14-passenger non-CDL van buses that organizations and schools are allowed to provide their own drivers for. 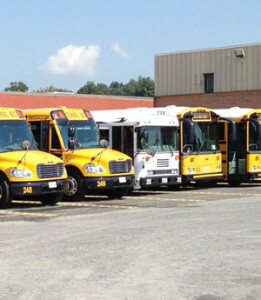 We are also available to offer full-sized school buses for lease. These vehicles are brand new and your name and logo can be placed on the side. We find most people use this as a mobile marketing opportunity as well as a cost-effective way to provide transportation. Van sizes range from 14 passenger non-CDL vehicles to 44 passenger full-size school buses.